I didn't do a lot of after Christmas shopping, but I did make a trip to Tuesday Morning and found a couple of things that I love. 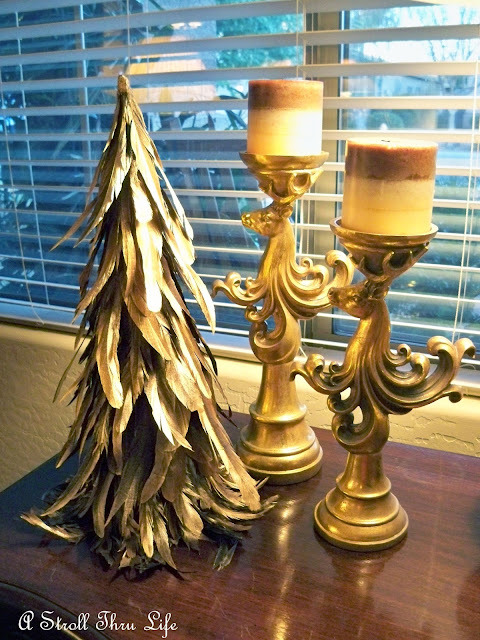 I really wanted one of the feather trees that I kept seeing everywhere, but they were so expensive that I just passed. The cheapest one I saw was around $30 and that was not in my budget. I was so thrilled when I found these three treasures. The tree and the two sconces were a little over $20. The tree alone was marked down to $7.50. Now that is definitely in my budget. The feathers are such a lovely burnished gold color, really pretty. I also thought the detail on the sconces were gorgeous. I might spray paint these in Oil Rubbed Bronze, just have to think about that for a while. Great finds and I think I can use them as part of a winter vignette for a while and I definitely have all kinds of Christmas decor ideas for them. So have you found some really great buys after Christmas? Hi Marty, now that's my kind of bargain. Great finds. Love all 3 but those scones are really gorgeous!! Oh Marty, I wanted one of those feather trees too. I just never could find one for a price I could afford. Our Tuesday Morning just does't have much of a selection. The sconces are great. Like you, I did buy some things after Christmas and mostly for a "winter" theme rather than just Christmas! 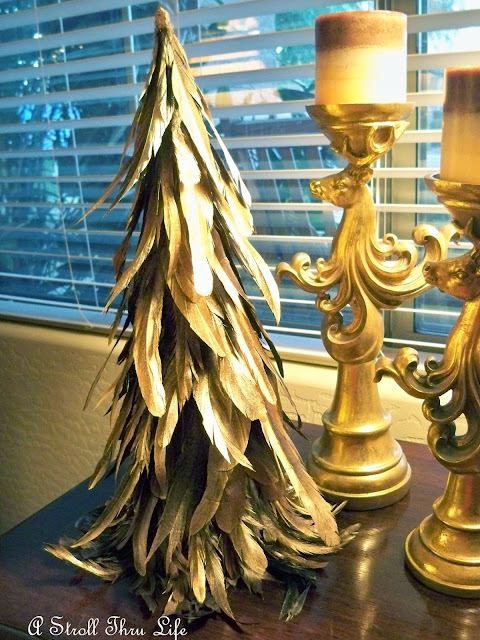 Hi Marty, Very pretty sconces and adore the gold feather tree. You did well in your after Christmas shopping! All three pieces are perfect to get your through the winter, Marty! I love after Christmas sales, too. You really got these at rock bottom prices! Very pretty! Don't you love when you find items you can use for more than one holiday? Great buys. I did a post on my bargains too! Churchill plates for .40 and Johnson Bros for 1.00! This is my first time to comment on your blog, but I have been following it for two years. Love your style and the kindness you always show. I missed the trees, but I did find Fitz and Floyd Frosty's Frolic cookie jar, S&P and canapy plate all for under 30.00. The lowest I ever saw the cookie jar was 80.00. It seems we've all been finding some great after Christmas bargains. Pretty! Great finds. I tend to focus on stocking stuffers and Christmas cards. It's always my goal to buy everything for the stockings by January. I am finished with their stockings for next year, except the candy I'll add. Always fun to get a good deal! Great finds, I have loved those feather trees too. I must say this year I was not able to find too many after Christmas sales. With as much as I put away, maybe I didn't need any more. The floor is almost done and I am more than ready to start painting the walls. I love repainting a room and starting fresh. After Christmas is such a great time to find decorations, right? My hands down favorite Christmas decoration is a vintage nutcracker that I picked up for $3 at one of my favorite vintage stores. Marty, great finds and what a bargain. Love the tree. I was under~the~weather and missed most of the after Christmas $ales, however the one I did attend allowed me to add some icy faux greenery for the Winter decor!!! You found some great buys at Tuesday Morning!!! They truly enhance your already gorgeous decor!!! 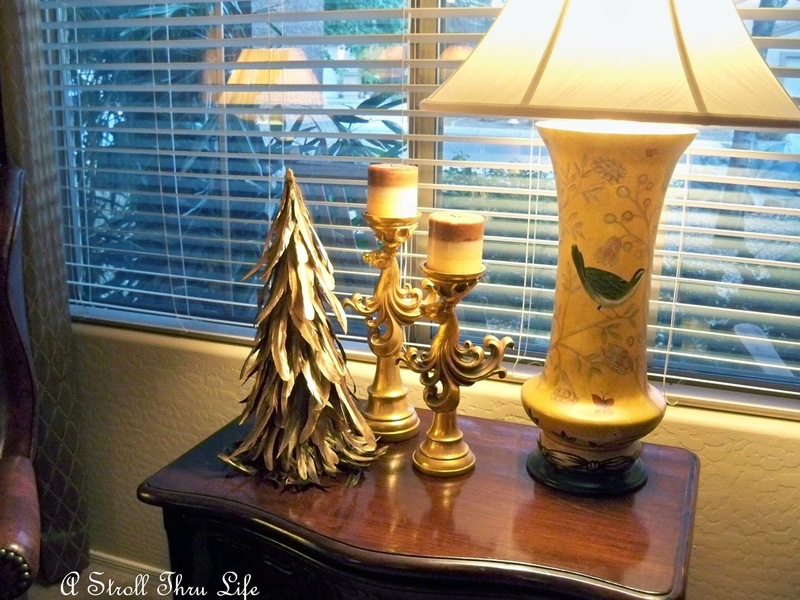 Thanks for sharing this lovely Winter vignette with us! Wonderful finds Marty! Those candleholders are just beatuiful! Way to go!!! Won't it be fun to pull these out next year...like early Christmas presents! Marty, what fabulous finds. Yes, I can see how you can decorate with those pretty much all winter. The tree is just gorgeous! That is my kind of shopping. 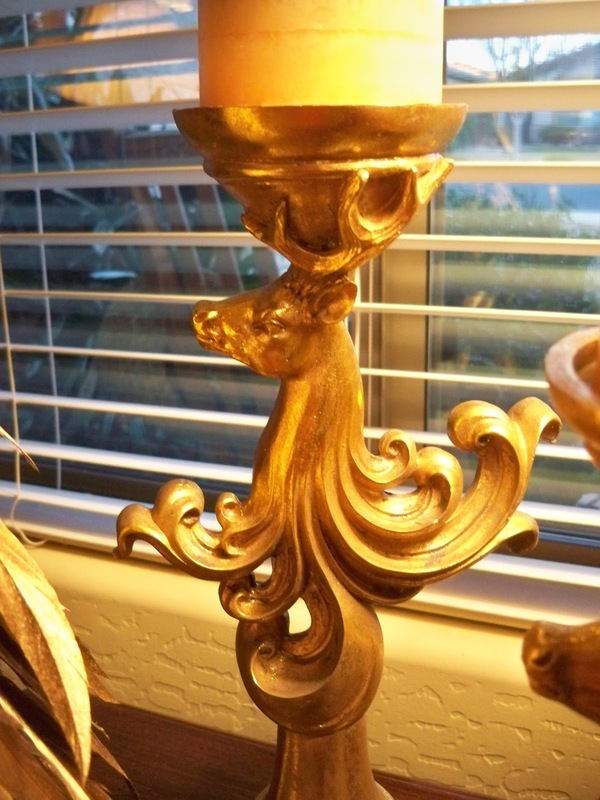 Didn;t even see the candlesticks had deer head details until you shared a close-up with us! I bought shoes and boots at the post-holiday sales. I needed them so badly! I wasn't able to get out to shop after Christmas, but the Tuesday Morning stores around here are no longer promising. The last couple of times I shopped (I mean stopped) there, I noticed that they were quite pricey. You made out! NICELY DONE! I also went to Tuesday Morning after Christmas and luckily a pillow I had seen in November was still there! I pouted because I loved it but it was $24.99 - a little steep for a pillow I didn't need. But when I went back, someone must have it in the regular pillow section on the bottom so I got it for $12.50 along with two other pillows in burlap and silver satin which say HOPE which were like 7 bucks! And adorable little holly place cards for 60 cents. A very good day! And I am crushing on those candlesticks - beautiful!